Note: This sweater also fits my 18 month old as a long sleeved cardigan. Scroll down to enjoy this pattern for free or you can purchase a PDF to print. This sweater is worked from top down in one piece. When instructed to join, join with a slip stitch to the first stitch of the round. Foundation Single Crochet (Fsc): Foundation Single Crochet (Fsc): Ch 2, insert hook into the 2nd ch from hook, yarn over, pull up a loop (2 loops on hook), yarn over, pull through 1 loop on hook (this makes the ch), yarn over, pull through 2 loops on hook (completes the sc). Next Fsc: Insert hook under the 2 loops of the ch of the last st and pull up a loop, yarn over, pull through 1 loop, yarn over pull through 2 loops. Video HERE. Herringbone Half Double Crochet (herr hdc): Yarn over, insert hook into stitch indicated, yarn over, pull through stitch AND first loop on hook, yarn over, pull through 2 remaining loops on hook. Cluster (CL): (Yarn over, insert hook into stitch indicated, pull up a loop) 3 times, yarn over, pull through all loops on hook. Place a SM on st # 4, 10, 33 and 39. You are adding 10 sts each row. Row 1 (dividing row): Ch 1, turn, working in the FLO, *herr hdc in each st before the SM, herr hdc in the marked st and remove SM, ch 5, herr hdc in the next marked st (skip all sts in between the marked sts) and remove SM; repeat from * 1 more time, herr hdc in each remaining st. 96 plus 2 ch spaces. Repeat row 2, 18 more times (20 total rows). Row 1 (ws): Ch 1, working in the FLO, (herr hdc in next, CL in next) evenly up the front, around the neck and down the other front. 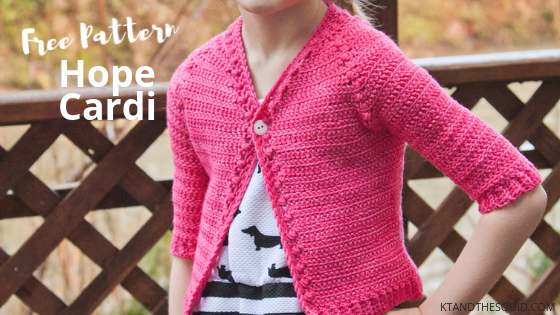 Tip: work one st per row when working on the fronts of the cardigan. Row 2 (rs): Ch 1, turn, working in the FLO, herr hdc in each st across. Repeat rows 2 and 3 across the bottom of the cardigan until you reach the other side of the front trim ending with row 2. Next Row: Turn, working in the BLO sc in the 1st 4 sts, ss in the ends of the 2 rows of the front trim. Finishing Row (rs): Ch 1, turn, evenly sc in each st up the front trim, around the neck and down the other side of the front trim. With RIGHT side facing join to any st of the underarm. Repeat round 2 adding a decrease row (instructions below) every 2 rounds alternating between decrease round 1 and 2 until you have 18 total rounds. Tip: if you do not alternate between the 2 decrease rounds the seam down the sleeve will slant to one side. Decrease Round 1: Ch 1, turn, working in the FLO herr hdc in each st until 1 st remains, skip the last st, join with a ss to the 1st st. Decrease Round 2: Ch 1, turn, Skip the 1st st, working in the FLO herr hdc in each remaining st join with a ss to the 1st st.
You will end with 25 sts. Repeat rows 2 and 3 around the entire sleeve opening, join the first row to the last row working in the BLO to keep the ribbing consistent. Fasten off, repeat on the other arm opening. Sew snaps (or buttons) onto trim spacing them about 2” apart. I only used one in the sample and placed it at the beginning of the shaping of the raglan only. If using buttons they will fit through the space between the CL and Herr hdc of the front trim.